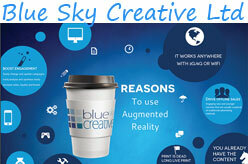 Blue Sky Creative build custom augmented reality apps for you. Specify your branding splash pages, icons etc and even add a custom publication carousel where users can select from your different publications to then augment with the app. Web Hosting : Shared Hosting, Reseller Hosting etc.